Starting last 2017, Touch Mobile started to offer LTE SIM and if you are old TM subscriber you can upgrade your old SIM to LTE SIM, just go to the nearest store and present 2 Valid ID's at least 1 primary ID.Last time they introduce the TM Easy Plan 150, where you can get unlimited calls and texts plus free FB internet access and valid for 30 Days. As part of the continuous effort and promotion especially also to improve network services, they offer a free SIM upgrade to LTE by visiting the nearest Globe stores. 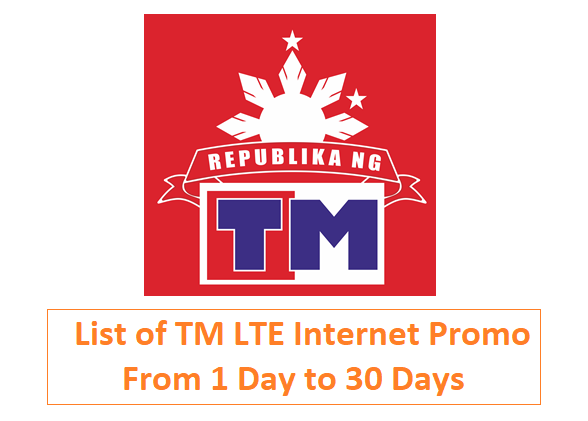 You can also buy a new TM LTE SIM for only 30 pesos, that's negotiable right. Select from the list of suggestions based on your needs, with the validity of 1 day, 3 days, 1-week up to 30 days or 1-month mobile internet surfing. Of course, it is better to use your new TM LTE SIM for faster and more constant data connection. Note: Send all the keywords to 8080 to subscribe. *List of GAMES: Arena of Valor, Clash of Clans, Mobile Legends, Lineage 2, Pokemon GO, Clash Royale, VainGlory, Summoners’ War, Marvel Future Fight, Legacy of Discord – Furious Wings. You can visit Republika TM for latest updates and changes on above promos.